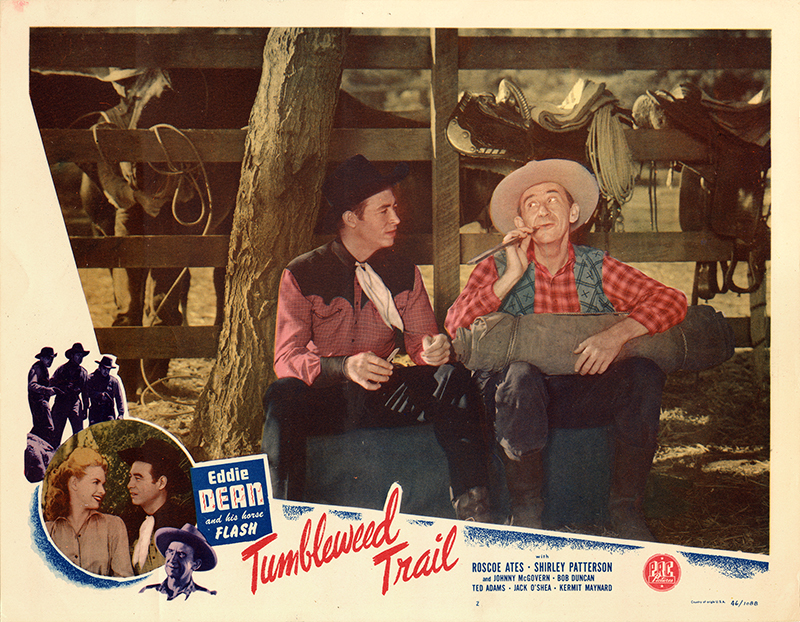 SCVHistory.com LW3362 | Melody Ranch | Lobby Card-2: Eddie Dean in 'Tumbleweed Trail' (PRC 1946). Eddie Dean in "Tumbleweed Trail"
Lobby card, 11x14 inches, No. 2 of 8. Singing cowboy Eddie Dean — a 1982 inductee into the Downtown Newhall Walk of Western Stars — and his horse Flash star in "Tumbleweed Trail" from Producers Releasing Corp. Pictures (1946). Filming took place in Placerita Canyon at Andy Jauregui's ranch and Ernie Hickson's Monogram Ranch (which became Melody Ranch) and at Corriganville in Simi Valley. Dean (1907-1999) and The Sunshine Boys (M.H. Richman, A.L. Smith, J.O. Smith, Eddie Wallace) sing "Tumbleweed Trail" (Eddie Dean, Glenn Strange), "Lonesome Cowboy" (Eddie Dean, Johnny Bond) and "Careless Darlin'" (Ernest Tubb, Lou Wayne, Bob Shelton). Credited cast includes Roscoe Ates, Shirley Patterson, Johnny McGovern, Bob Duncan, Ted Adams, Jack O'Shea, Kermit Maynard and William Fawcett. Maynard also does stunt work in the picture, as do Carl Mathews and Matty Roubert. Frank Ellis and Lee Roberts round out the cast. LW3362: 9600 dpi jpeg from original lobby card purchased 2018 by Leon Worden.